This last week the Winter Olympics started in a show of unity as the two Koreas marched together in the opening ceremonies. This is an international quadrennial gathering that celebrates the fun people can have when it is really, really cold out and PyeongChang did not disappoint, with record breaking cold. Not to be outdone, the Weather Priestess here in Pelicanland decided on… a heat wave? Yes, as the world watched miserable sportscasters bitterly complain about the unearthly freezing temperatures we here were suffering, yes suffering through 80 degree days. And yet, somehow the rest of the country doesn’t seem to want to send exchange referees over here this time of year. The mind boggles. To my certain knowledge the only non-Pelicans in town were national appointments. While we can not guarantee beach-worthy weather, at this time of year there are very few leagues playing. Essentially you have the west coast and some D1A matches in Texas and that may be about it. All of those snow-bound referees in the midwest and east looking for a match are more than welcome because what we can guarantee is quality rugby matches. I would start harassing your exchange officer immediately. There are few better places for Winter Athletics than Northern California. Matches? We Don’t Report No Stinking Matches! A significant percentage of the flock are still having issues with the Whostheref assignment and match reporting system that we are using these days. We have all had a few months to get used to this system so it is time to start using it. Please note that should you decide to just email me scores and a writeup it will be summarily ignored. I have neither the time nor the inclination to comb through my email for referee reports. To be honest, I don’t know how my predecessor managed it. The notable exceptions to the above blanket statement are, of course, matches that are not assigned here in Pelicanland and are thus not in the system. So any referees on exchange can send me their thoughts as well as our excellent Roving Pelicans Tom Zanarini, Stephen Valerio and any others who wish to tell us of their exotic rugby experiences. To help educate the flock Our Scott Wood has put together a nifty User Guide that is accessible from this very website: http://pelicanrefs.com/resources/whos-the-ref-user-guide/ . There will also be a presentation at our meeting next week. We live stream those so there are no more excuses. The Gary Gold era in USA Rugby has started with a couple of wins over an Argentine B side and a full Canadian side. Wins are very nice – especially against Canada – but we still look very much a 2nd tier nation. Personally I would expect us to do well in the ARC – and we have, being the defending champion – but I still hunger for that first tier 1 scalp. If MLR is more successful than Pro Rugby (not a high bar, true) then we may finally have the professional league that is so needed to build a competitive national team. I have high hopes and a sense of great optimism that is only tainted by the knowledge that our national teams are overseen by USA Rugby who has shown very limited ability to successfully organize anything. More on that next week. If you have not already signed up to referee the Las Vegas Invitational then you need to do so soon as time is running out. How else will you be able to rub shoulders with and say you refereed alongside legends such as Phil Klevorick? Saturday morning pitted old rivals against each other. Life West played their northern freeway rivals, the Berkeley All Blues. The match was a dead heat, stiff competition, and play from both sides kept the game within reach for the entirety of the first half. However as the match went on, Life West was able to separate themselves with their experience. The game broke wide open for them in the second half. It was a real pleasure to ref a two teams with such well disciplined players. Both teams wanted to avoid avoidable penalties and played a hard clean game. No back chat of any kind from players or coaches. With the perfect weather and atmosphere at Witter Field it was the postcard moment for why referees carry the whistle. Thank you to both teams for letting me be a part of your day. This match was played on a glorious sunny day in a really good competitive spirit – the high scoreline does not reflect the full match contest and the competitive nature of the breakdown play. Cal kept the tries ticking over steadily with 8 tries in both halves with 5 converted in the 1st and all 8 converted in the 2nd – the quality of the replacement kicker (21) in the second half was particularly impressive with multiple wide out conversions splitting the uprights!! Utah Valley had a few periods of pressure during the first half and early on turned down a kick at goal when only 12 – 0 behind. Unfortunately they turned over the lineout and the opportunity was lost. They did deservedly cross for a score mid way through the second half and maintained field position and pressure for a period but Cal defended well and countered with some long distance scores on turn overs. My thanks for the support from Pete and Rob/Tom who took a half each on the sidelines. Great day at Cal Poly. Nice and warm weather throughout the match so no problem there. Cal Poly is really having their program together. I am not sure what to expect from Santa Barbara Academy. Teams were ready to go so the kick off was about 5 minutes early. From kick off, these teams came to play. They went at each other. The main issue that I was having was they were trash talking to each other. This elevated during the half which led to a talking to the captains. This lead to additional penalties to each side for back chat. Eventually right at the 40 minute mark a Yellow Card was issued to Cal Poly #7 for back char. The second half was a lot better and the rugby was great. One thing that I need to work on is to square my shoulders to that I can catch the off sides. Chico simply dominated all aspects of the game. Chico maintained excellent control of possession and was adept at bringing the fullback into the back line creating numerous attacking opportunities. San Jose State had a few standout players but were out-matched by the home team. San Jose didn’t help themselves with numerous offside penalties, ultimately leading to yellow cards for repeat infringements. It is early February, a time that many call the dead of winter, so naturally I was glad to escape the heat and get down to coastal Monterey for some rugby in perfect conditions. I arrived a late to see both teams already well into their warmups. Yes, I did arrive late, showing up at 12:30 for a 1:00 game, but I feel that the car with its wheels uppermost next to the car facing the wrong way with a crumpled front end, blocking 1 of the 2 lanes on Hwy 156, may have been significant. No matter. With the sun shining down, the temperature in the mid 60s, a perfectly marked field and two well supported teams eager to play I made damn sure that we were ready to go at 1:00. And so we were off. Humboldt St had the early advantage as CSUMB could not stay on side at the ruck. Several early penalties necessitated a talk with the captain and things soon sorted themselves out. Unfortunately for the home side, HSU was ruthless in capitalizing on these mistakes and were running in tries. The visitors scored 4 tries in the first half with 2 conversions. Not to say that the home team didn’t have its chances, because they did. The scoreline did flatter the Lumberjacks a bit, but every time the Otters got close the inevitable turnover, knock on or penalty would undo all their hard work. HSU showed a more convincing finishing touch is all. The loss of CSUMB’s scrumhalf to a reaggravated knee injury near the end of the half was particularly devastating. The HSU #13 Dalvin Jamal-Milton was exceptionally lethal in the back line as he showed the speed and vision to repeatedly carve up the Otter line. Unfortunately, the reason I know his name so well is, with about a minute left in the first half, he made a tackle and managed to get the player off their feet but not safely back to ground, so I gave him 10 minutes to think about the error of his ways. Even though they were down a man the second half opened with another HSU try almost immediately after the whistle, thus opening up the NSCRO substitution law allowing HSU to empty their bench in the second half. (A great idea, in my opinion. This should be considered for all youth and lower level club competitions.) As the half progressed and CSUMB got their tail up and finally got on the scoreboard with a well earned try. With only a few minutes left HSU had some discipline issues as they developed a pattern of illegally killing the ball whenever the hosts got some momentum and I finally had enough of it when one of their players crawled through a ruck to grab the ball and bring it back to his side. The visitors ended the match down a player and Monterey Bay took full advantage to score a second try. Well done, them. The match ended with handshakes all around on a perfect rugby day. A nice clear, cool day. Both teams were riddled with injuries and used new players. The score does not reflect the competitive nature of the match. I’m not sure why USA Rugby would have a referee fly in from Chicago on the day of the game for an 11am kick off. Why not the night before? The flight was delayed and the referee was left with no time to warm up properly. Life West and Santa Monica both showed first game issues and the game became more fluent in the second half. Life West wore down Santa Monica, ending comfortable winners. Life West D-2 woman hosted the Sacramento Amazons at Sunset Park this past Saturday. Traffic was heavy and construction at the school/park caused me to get to the field around 2:15 for a scheduled 3:00PM kickoff. Both teams were in a full warm up when I arrived and told the kick off had been moved up to 2:30PM. The field was in bad shape but well marked with goal posts padded and flagged. No technical area, no cones or flags marking anything but goal line. Amazons had 25 or so players, Life had twelve players kitted up. We kicked off about 2:40PM with Life fielding 12 players to start. Level of play was good with Amazons scoring two quick trys with the three player advantage. Life did score on a long run by winger Angelina Lomu at 11 minutes. Amazon forwards scored their third try of the first half at twenty minutes. The Amazons forwards were bigger and used the pick and drive to breakdown the 12 player Life team. Around 25 minutes the Life team first side “reserves” showed up to fill out the 15 player roster. Life then scored two try’s to finish the first half. Life 24 Amazons 15. The second half saw Life controlling most of the possession but both teams scored two unconverted try’s each. Amazons led by captain Ofa Mailangi who played at least three positions and took some kicks. Both captains were a pleasure to work with. First try to Olympic at 7′ but one-way traffic by OMBAC the rest of the match. Olympic held OMBAC scoreless for the first 30 minutes but the OMBAC scrum steadily gained ascendancy and began to dominate set pieces and provided a great platform for their backs. HT 7 – 17. Second half was more of the same as the OMBAC forwards dominated and provided plenty of front-foot ball for their backline. Olympic was always competitive and had some deep forays into their opponent’s half but were frequently undone by knock-ons and general a little bit of sloppiness. The drive up to Davis was a mess due to an accident on the 80 east, luckily I was in good company and we barely made it on time to her (the great Leah Berard’s) match. So many random events either occurred or didn’t occur that day which made things a bit more rough than they needed to be overall, including a very windy day at the office. After toiling away as AR for the A-side match, I shoved snacks down my throat in an attempt to not die before my own kickoff, keen to get into my zone and have a good run out. After a quick toss with the captains, it was time to go. The game going on around me was actually really awesome. The guys had pretty good discipline overall, and the match was well contested with the Davis B side starting a little slower than San Diego State B. SDSU came out the first quarter or so, with much intent to take their possession and turn it into points. Slowly but surely, the Davis boys never backed down, slowly creeping up the scoreboard keen to overtake the visitors. After a necessary halftime break, we got back into it. This time the Davis boys had a fire lit, and I’m sure it came from some choice words from the coaching staff and team leaders. They came out with the same intensity that SDSU had started with, and conversely their competition came out ready to play but not quite as intense as the beginning. Davis was able to turn their possession into much needed points, eventually overtaking the scoreboard. It was a tooth and nail fight to the end, with a lovely mix of tries from the hard hitting forwards and some individual brilliance from the backs. One of the more memorable tries was in the first half, it was a great read from a Davis defender who stole it mid-air from the SDSU backs looking to stretch them, and he took it about 75m for a score. Long story long, SDSU couldn’t convert their final bits of possession into more points, and Davis held on for the win. This is what Pelican Referees can expect if they continue to not provide narratives to their matches – a stern talking to. 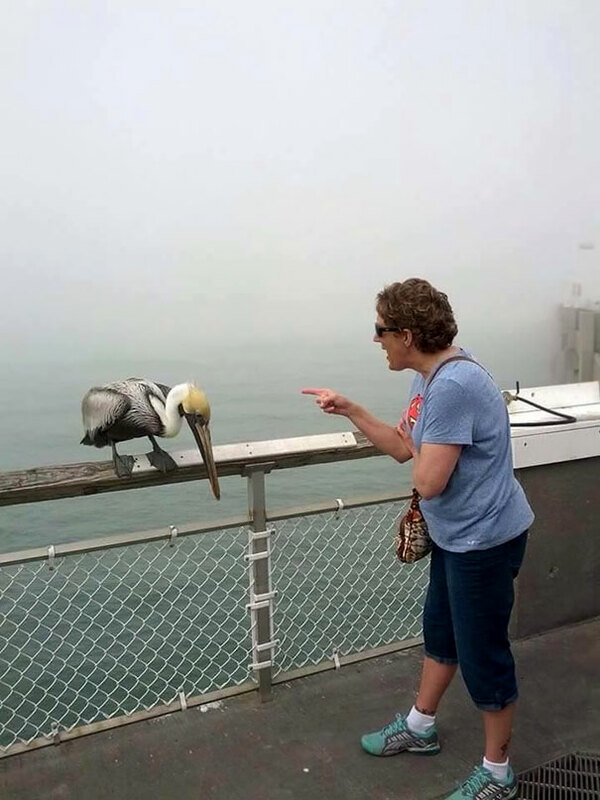 Much like the Pelican in the picture, you will feel shame. This entry was posted in News on February 15, 2018 by James Hinkin.